California’s ambitious goals for cutting greenhouse gas emissions are revving up the market for electric vehicles. And it’s not just cars anymore. In a parking lot adjacent to -- appropriately enough -- Golden Gate Fields racetrack in Albany, an upstart company called Thor Trucks had its prototype tractor-trailer rig doing laps for selected onlookers on Monday. Heavy freight is one of the biggest obstacles to achieving California’s greenhouse gas reductions for 2030 and 2050 (40 and 80 percent below 1990 levels, respectively). The biggest share of California's climate emissions comes from transportation and as of 2015, heavy-duty vehicles (that would include buses) accounted for 7.4 percent of total emissions. "We wanted to start with heavy-duty vehicles for that exact reason," says Giordano Sordoni, Thor’s chief operating officer. "People look at these vehicles and the weight that they move and the jobs that they do and think, you know, electric vehicles might not be capable of that," reflects Sordoni. "And we’re proving that in fact, they are. They're really powerful solutions that can provide the torque and performance, and even beat that of a traditional vehicle." To bystanders, perhaps the most impressive thing about Thor's ET-One demonstration rig is where it registers on the decibel meter; all you hear from under the hood of this full-size Class-8 tractor is an air compressor for the brakes. Underway, the rattling of the 51-foot trailer is louder than the power plant. Sordoni says the biggest engineering challenges were finding the right battery array and developing the software that runs it all. With a range of 100-to-300 miles, the ET-One not quite ready for the long-haul. It’ll be aimed at local and regional duty. That might be a good fit for places like the Port of Oakland, which has been under pressure to reduce diesel exhaust from big rigs that are constantly roaming in and out hauling containers. "I think now is a good time because battery costs have come down," says Catherine Mukai, an environmental planner for the port, who attended the Thor demo for a test ride. "We’re seeing a lot more competition for Class-8 trucks in the market." During the demo, Thor executives offered to set up a demo day for port truckers. Sordoni wouldn't say how many pre-orders Thor has for its promised production models. "We're doing well," is all he'd allow. He's seeking partnerships with other truck makers but it's unclear what form those arrangements would take. While he asserted that, "We plan to build, badge and sell our own vehicles," he added that, "While other startups in this space are eager to dive in and spend a billion dollars on a manufacturing facility and hope everything goes well, we want to take a more reasonable -- maybe -- approach." 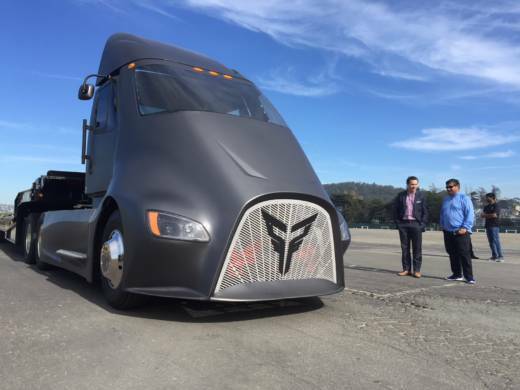 Thor is an upstart in the market, but its founders claim they’ll be ready to roll before Tesla’s much-anticipated Semi, which is expected sometime next year. Sordoni and co-founder Dakota Semler are betting that fleet operators will quickly see the advantages of electrics over conventional diesel rigs, seeing savings in fuel, maintenance and compliance with California's ever-tightening air quality regulations. "There are also maintenance savings," he says, "when you go from an internal combustion engine that has 2,000 moving parts to an electric vehicle, which has 20." There are advantages for the drivers, too. Behind the wheel was 42-year trucker Tom John, who is Thor's regular demo driver. I had to ask him if he wouldn't miss the macho roar of his own 600-hp Peterbilt rig. "Yeah, I would," he sighed. "But you know what? I'm 80 percent deaf in this ear," he said, pointing to his left ear. I could relate. When the local recycling truck roared past my window at 5:57 on Monday morning, I was more than ready for the electric age.